This helps those with visual difficulties to fill containers with liquids and avoid the spillage that they may find difficult to clean up. One of the many questions raised by people when they go blind is: how do I fill glasses, cups and jugs? This utility is good for those who are entering the world of blindness and require help to improve their personal autonomy skills. 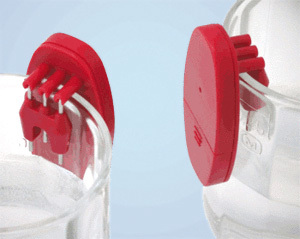 It is very easy to use; place it on the edge of the container to be filled, and simply wait until you hear a sound indicating that the contents have reached the top.